First of all, a big thank you to Kaylee for allowing me to borrow Shatter Me. It was fun to review--definitely one of my more interesting review picks lately! SUMMARY: Juliette has been in her cell for 264 days. 264 days of no contact with other people. One touch from Juliette is all it takes to torture or even kill another person. Suddenly, Juliette has a cellmate, a boy she remembers from school years before. He does not seem to remember her, but soon, both are swept up with The Reestablishment and its cruel leader, who plans to use Juliette's power to serve his own purposes. 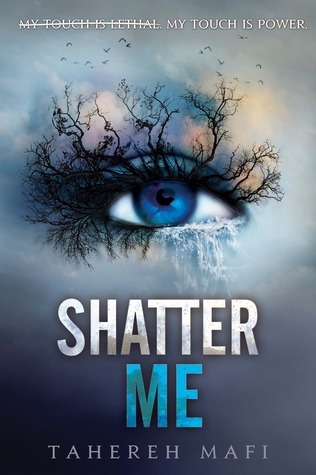 REVIEW: If I were to rate Shatter Me based solely on teen appeal, it would be a 5-star read. The premise is interesting, and Mafi definitely knows how to create a swoon-worthy male lead. I love the front cover (the one pictured above with the eye, not the one with the pretty girl), and the trailer is everything a trailer should be. Shatter Me has plenty going for it, and I can see it being a popular choice in my library. Here's the problem: the writing drives me crazy. I'm not going to go bashing the author here though--Ms. Mafi clearly has writing talent, but I think she tried too hard with this one. For me, the random strike-through text is gimmicky distracting; it doesn't add anything to the plot give insight into the characters or help readers understand their world. Ditto for the repetitive words and phrases and Juliette's weird obsession with numbers that seems to come and go from one chapter to the next. ...is Shatter Me worth the time/monetary investment for teens, parents, teachers, and librarians? Despite my many complaints, I think it's ABSOLUTELY worth it. I booktalked this one with a class of seventh graders today, just to get a feel for their response to it. I also showed the publisher's trailer. Several students excitedly asked me if I have it in the library, so I can tell I will have no difficulty promoting this book with my paranormal romance readers. I'll probably end up getting it for the library though I do have some concerns about the steamy kissing scenes. I personally don't think they are a huge deal, but I can see it raising some eyebrows. THE BOTTOM LINE: The weird writing style brings it way down for me, but I don't believe my students will care about that at all. STATUS IN MY LIBRARY: Sexual content makes this better for high school than middle school. For high school libraries, I think Shatter Me is a must. Students are going to love this book, and it may be just enough to convert some non-readers. Sexuality: high; seriously intense kissing scenes! Admiration of frequently-exposed male chest (think, Taylor Lautner in New Moon); lots of touching, caressing, groping--let's just say that they rounded second base soundly and the third base coach is waving them towards home. I'm totally undecided about this book. If I see it in the library I'd get it but definitely wouldn't buy it.